Al Sapienza is a true artist who has the rare ability to explore a boundless range of characters through acting dancing and singing, on both the stage and the screen. Sapienza has danced his way onto the big screen in MTV's musical romantic comedy, “The American Mall”, which is slated to be released in the same manner as the hugely popular film High School Musical. Simultaneously, he returned as Mayor Frank Panzerella on Showtime's hit series “Brotherhood”, which is now entering into its third season. He will also be seen in this fall's feature thriller, “Saw V” (Lionsgate) along side Shawnee Smith and Tobin Bell. Catch Al in the Emmy Nominated Netflix Series, "House of Cards"! See Al in Netflix's "House of Cards"
Al also has been working "Million Dollar Arm", "The Life", "Late Phases", "Godzilla" "Lucky N#mber", "Meat", "Seasick Sailor", and "The Last American Sailor" , to name a few movies. Television, "Rookie Blue", "Arrow", "Golden Boy", "The Firm", and "Blue Bloods." See Al in Netflix's "House of Cards"
Educated at New York University in the performing arts, Al Sapienza's acting career has spanned over 2 decades. After graduating from New York University, Al made a life changing decision to move to Los Angles to study acting and to throw himself into the world of theater, working on over 30 plays to prove to himself that he could be a great actor. Appearing in several movies including the award winning film "Lethal Weapon 4" with Mel Gibson, Danny Glover and Joe Pesci, "They're Just my Friends” with John ‘Cha Cha' Ciarcia, “Free Willy 2: The Adventure Home", "A Month of Sundays" with Rod Steiger, "Carlito's Way: Rise to Power" with Sean 'P. Diddy' Combs and Burt Young, "Scriptfellas" with Paul Sorvino, "The Path to 9/11", to name a few. Al Sapeinza is also a familiar face on the television screen. Besides being Uncle Junior Corrado Sopranos right hand man, the mean-streaked mafia hit man, Mikey Palmice, on the HBO series, "The Sopranos", Al has also made television appearances on the Fox Network program "Prison Break" as the mafia kingpin Philly Falzone, “The Brotherhood" as the character Mayor Frank Panzerelli, "Law & Order, Criminal Intent", “Port Charles” as Mario, “Melrose Place”, and “NYPD Blue” are among his numerous television credits. Besides all this, he has also found the time to be the devote time to various charities and he still jogs, only with a bullet proof vest on. In an industry which thrives on typecasting, Sapienza is one of those rare talents who continues to challenge himself, by continuing to portray a wide variety of characters. The New York handsome native can morph from a lead in a romantic comedy to a deviant mobster into a sociopathic killer and then to a faithful sidekick. His passion to intensify his craft has catapulted him into even more diverse roles. And his body of work epitomizes him as a true artist. Sapienza currently divides his time between New York and Los Angeles. 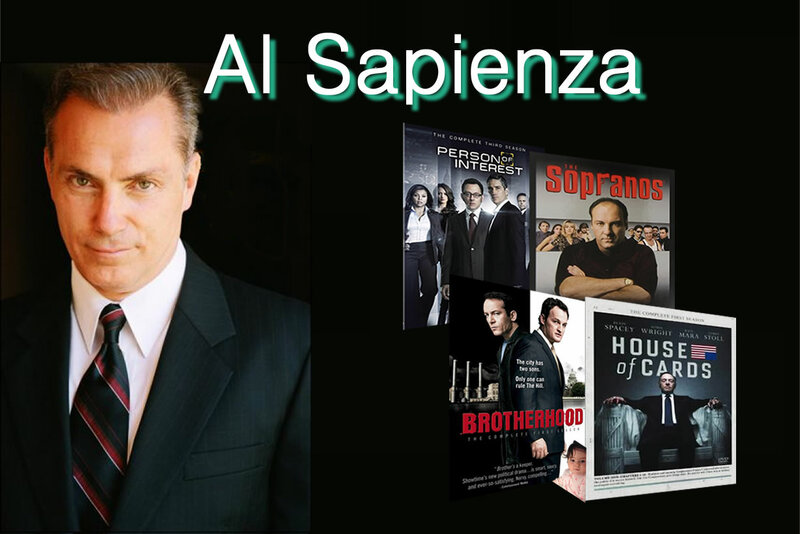 Al Sapienza DOES NOT on any social networking site such as MYSPACE, FACEBOOK, FRIENDSTER, etc. Profiles created on these sites are not created or authorized by Al Sapienza and should be considered fraudulent.